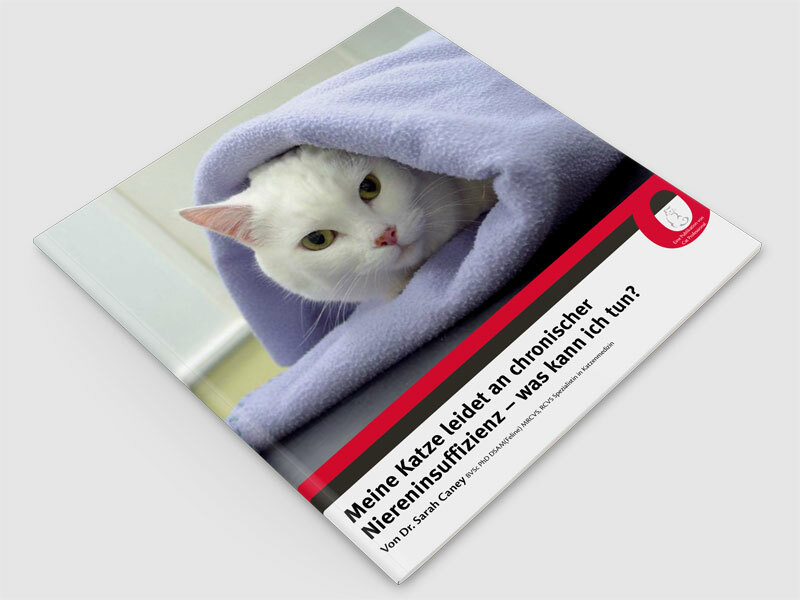 Meine Katze leidet an chronischer Niereninsuffizienz – was kann ich tun? A 68 page, fully illustrated book aimed at cat owners and veterinary professionals, 2nd edition launched June 2013. In German. Caring for a cat with kidney failure has been written as the perfect information source and support tool for a cat owner whose cat or cats have been diagnosed with kidney failure. It is also designed to be a resource for student vets, veterinary nurses and technicians. The science and emotional aspects of dealing with a diagnosis of kidney failure are addressed. 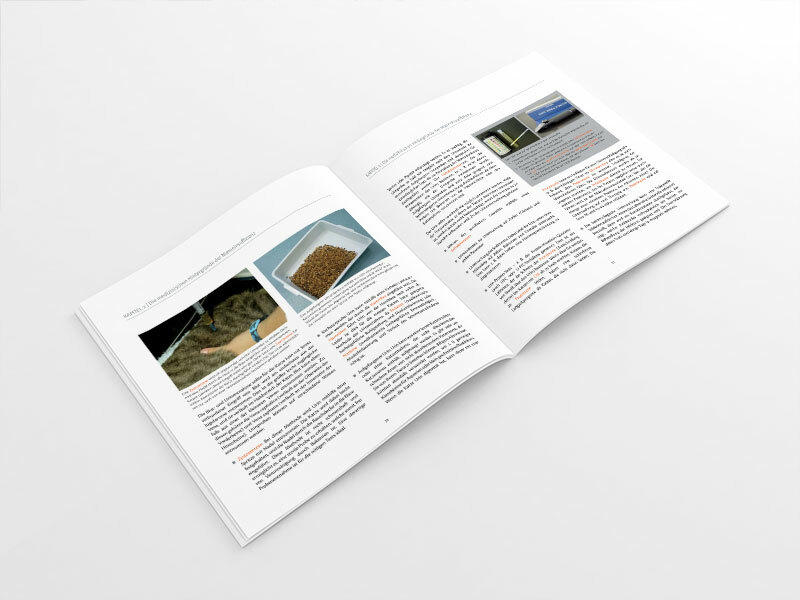 The book is 58 pages long and includes colour photographs illustrating different clinical signs (symptoms) of kidney failure, diagnostic tests and treatments such as a step by step guide to safely and successfully giving pills to a cat. The book explains what a diagnosis of kidney failure means and how best to treat the condition giving your cat the best care and helping it to live as long and full a life as possible. A case study is included to show how treatment can be successful and there is a glossary of terms possibly used by your vet. A 'must-read' for owners and vets alike. Sarah Caney is a leading expert on kidney disease in cats, and her book describes in clear language the various problems associated with kidney failure and - most importantly - what can be done to treat these problems This book is an invaluable tool for any owner wanting to work with their vet to find the right combination of treatments to give their cat the best possible quality of life, despite the diagnosis of kidney failure. The booklet Caring for a Cat with Kidney Failure is a very thorough document. 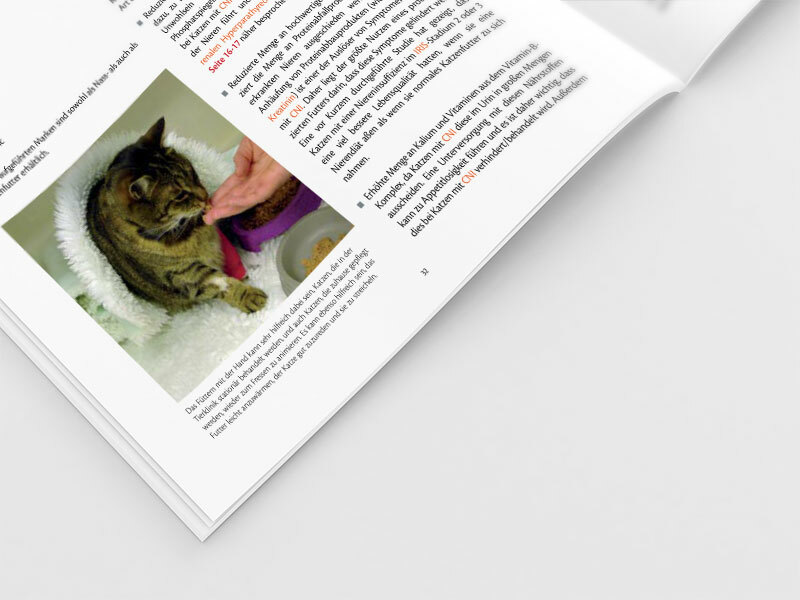 Easy to read and clearly outlines the whole process from noticing possible symptoms of kidney disease in our beloved pet cat to listing the possible outcomes of treatments available and how to continue managing the condition. It is very comforting to read a document written by an experienced veterinary specialist who respects both the emotional connection owners have to their pets as well as the owners capacity to understand the complexity of the condition. This is more than an information document, I believe it is a handy reference booklet I can see myself referring to time and again as I manage my cat's kidney disease. Spread the word – a book that will help take away some of the feelings of guilt, failure and helplessness of being told your cat has kidney failure! AND it will help understand the tests and treatment suggested for your cat meaning that you can ask sensible questions about why certain tests haven’t been done etc. Advances in treatment for kidney failure seem to take forever to filter down to individual practices and be introduced, perhaps because vets feels owners may only be willing to try diet and medication. Hopefully this book will enable owners to try a more hands-on approach if they and the vet are comfortable with this and give more cats a better quality of life. Declining kidney function is a reality that most cats face as they get older; in fact, it may even be considered age-appropriate. Dr. Sarah Caney's book is thorough and informative, yet remains easy to read. I recommend it for any caring cat person who wants, or needs, to know more about "kidney failure" in their kitty. Sarah is not only an expert in this scientific area but also at explaining the condition and potential treatments so that you will understand what your vet may recommend to enhance your kitty's quality of life for as long as possible. A reassuring read! This very clearly and thoughtfully written book will be of great benefit and comfort to anyone with a cat that develops kidney disease. It should also be essential reading for all vet students and veterinary surgeons so that they can know how to best help their patients. Feline renal insufficiency is a common diagnosis in general practice. Most vets have a sound approach to the complete investigation of these cases – including haematology, full urinalysis, urine culture, determination of the urinary protein to creatinine ratio and systolic blood pressure, and sonography of both kidneys and the bladder. Feline clinicians have no doubt got better at diagnosing these cases earlier using “wellness” and geriatric examinations, and pre-anaesthetic screening. No doubt we can also do a better job treating these cases – using the wide range of excellent “prescription diets” currently available, and in some cases adjunctive measures such as blood pressure control, phosphate binders, and in a minority of cases, ACE inhibitors and possibly calcitriol. But we have a PROBLEM. We are increasingly 'time poor' – and it's hard to make the time required to fully discuss what we have done diagnostically and therapeutically, and what the clients “need to do” for their cat with newly diagnosed renal insufficiency patient. It’s also hard to always be systematic and talk about everything that needs to be covered, and to present the data in a way that is both FRESH and tailored to the individual client. This is easy to do on a quiet day, but not so easy when you have a waiting room full of clients! And not so easy to do when it’s the third cat you have diagnosed with renal insufficiency this week! This is where Dr Sarah Caney’s outstanding e-book 'Caring for a cat with renal failure' has so much to offer. 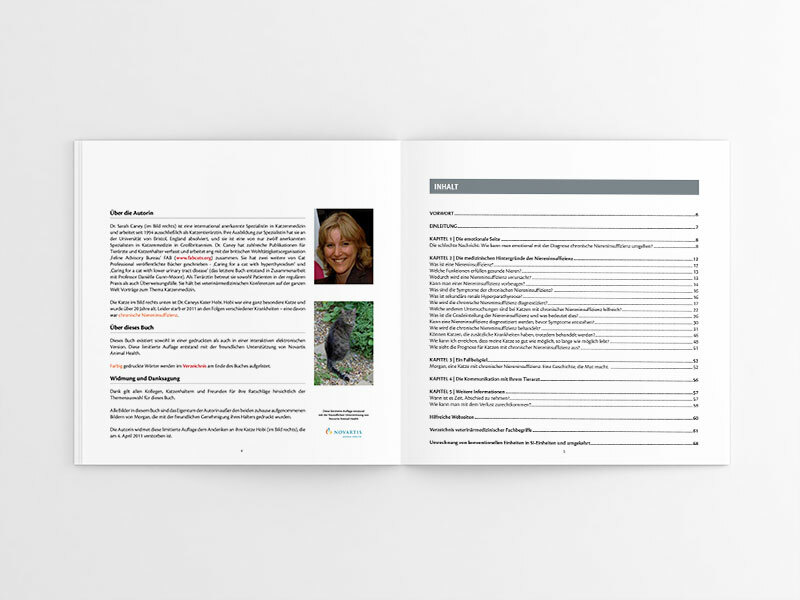 Sarah has taken a great deal of time and effort to produce a document that clearly and GENTLY goes through everything a client needs and wishes to know about the approach to the diagnosis and management of feline renal insufficiency. The writing is lucid and easily digestible. I can almost hear Sarah saying these things to a client as I read the text! The length of the monograph (some 40 pages of text, richly decorated with pertinent photographs) is sufficient to cover all the key aspects of diagnosis, management and prognosis – and the approach is flexible enough to cover every case scenario likely to be encountered by small animal practitioners. There is also a glossary of terms, a representative case study and a list of additional on-line resources. Importantly, cat owners are re-assured that they are not the cause of the problem, but rather PART OF THE SOLUTION. It offers hope and guidance, but without providing unreasonable expectations. In my view, every owner with a newly diagnosed case of renal insufficiency should read this book. It does not replace a long conversation with their clinician – but it should augment and amplify all the points covered in the examination room, so the dialogue will be reinforced and illuminated. It also provides additional information in more detail than is possible to provide in the time generally available for such a consultation. There is no doubt in my mind that routine use of this text will lead to improved vet-client communication, and improved compliance with therapy measures. This will likely translate into better case management. I am sure this will impact favourably on clinical outcomes, and thus be of great benefit to many geriatric cats. This is a well written, sympathetic but authoritative summary of the key aspects of caring for a cat with kidney failure, and will be welcome reading for those owners who need to understand their pet’s disease in more depth. Die schlechte Nachricht: Wie kann man emotional mit der Diagnose chronische Niereninsuffizienz umgehen? Welche Funktionen erfüllen gesunde Nieren? Wodurch wird eine Niereninsuffizienz verursacht? Kann man einer Niereninsuffizienz vorbeugen? Was sind die Symptome der chronischen Niereninsuffizienz? Was ist sekundäre renale Hyperparathyreose? Wie wird die chronische Niereninsuffizienz diagnostiziert? Welche anderen Untersuchungen sind bei Katzen mit chronischer Niereninsuffizienz hilfreich? Was ist die Gradeinteilung der Niereninsuffizienz und was bedeutet dies? Kann eine Niereninsuffizienz diagnostiziert werden, bevor Symptome entstehen? Wie wird die chronische Niereninsuffizienz behandelt? Können Katzen, die zusätzliche Krankheiten haben, trotzdem behandelt werden? Wie kann ich erreichen, dass meine Katze so gut wie möglich, so lange wie möglich lebt? Wie sieht die Prognose für Katzen mit chronischer Niereninsuffizienz aus? Morgan, eine Katze mit chronischer Niereninsuffizienz. Eine Geschichte, die Mut macht. Wann ist es Zeit, Abschied zu nehmen? Wie kann man mit dem Verlust zurechtkommen?